The Seroe Colorado Anchor is located in the southeastern part of the island. Through the years, the anchor has become one of the more popular points of interest in Aruba, where many tourists go to explore the surroundings and take some memorable pictures. When visiting the anchor you’ll notice how large it is and you’ll start to wonder how the Seroe Colorado Anchor found its resting place at this particular location. The anchor is approximately 10 feet 6 inches wide and 15 feet 6 inches tall. On the anchor, you will find three numbers. 4112 refers to the horizontal parts of the anchor and 4115 refers to the vertical parts. The third number, 21772K, tells you something about its weight in kilograms. There’s a concrete pad around the anchor and it has been painted in red. It was manufactured sometime in the 1960’s by a German company. How did this huge anchor get here? How did it get on land and to what ship did it belong? The story goes that a fully laden Very Large Crude Carrier (VLCC) carrying crude for ESSO got into trouble when it was looking for a place off the southeastern coast of Aruba to await further orders. Because of rough weather and strong currents, the ship eventually lost its anchor. Both the anchor and chain fell to the bottom of the sea. This all happened sometime after 1972. Records indicate that many anchors were lost by maritime vessels at this particular location. One day, purely by coincidence, the Seroe Colorado Anchor was discovered when other anchors were removed from the bottom of the sea at the same location. Lifting the Seroe Colorado Anchor only succeeded with great effort by a specialized company that had the necessary expertise to get the job done. The Seroe Colorado Anchor was taken to Oranjestad and placed at the wharf of the harbor. Later on, the anchor was taken to a fenced, protected area, close to bunker tanks in the vicinity of Oranjestad. The anchor was kept there for a while until it was transported to its current location. Between 1980 and 1985, the owner of Charlie’s Bar and Restaurant in San Nicolas took the initiative, together with a few other people, to come up with a plan and offer a petition to the president of the Lago Oil Refinery. The petition suggested to move the anchor from Oranjestad to its current location. Permission was ultimately granted and the anchor was transported to the Seroe Colorado area. When the Lago Oil Refinery was closed on March 31st, 1985, the anchor was dedicated “To All Seamen”. Since April 2005 the anchor also is dedicated to the owner of Charlie’s Bar and Restaurant who tragically passed away in September 2004. During the days of the Lago Oil Refinery, the anchor’s location served as a gate entrance to the Lago colony and was called Gate number 6. 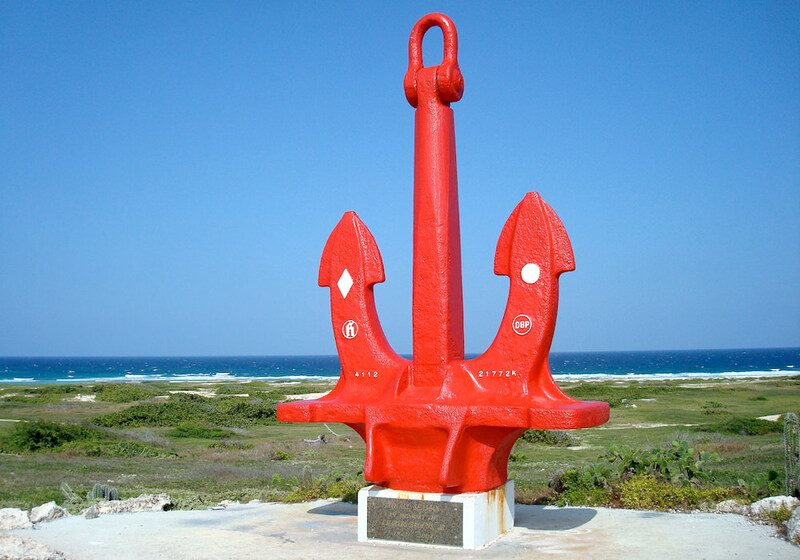 When the anchor was installed, it was agreed upon that it would serve as a signpost indicating directions to other points of interest in Aruba. Advertising or any other type of commercial exploitation was not allowed. Has the ship that lost the anchor ever been found? The story about the crude-carrying VLCC losing its anchor due to rough weather was never officially confirmed. In 2005, in an interview published in an Aruban newspaper, a German who worked for the Hoesch Dortmund Hörde Company stated that the number on the anchor (1412) and the letter H possibly hinted at the name of the anchor’s manufacturer. Furthermore, the letters ‘DBP’ on the anchor seem to indicate that it was patented by the Deutsche Bund. To our knowledge, it is still unknown to what German vessel, liner, ship or tanker the Seroe Colorado Anchor once belonged. The Seroe Colorado Anchor is easy to find, but it’s best to go by car. From Oranjestad, just follow directions to San Nicolas, then to Seroe Colorado. During your trip, you’ll pass Rodgers Beach on your right side when you are leaving San Nicolas. Once you arrive at the Seroe Colorado Anchor you might as well visit the Seroe Colorado Lighthouse. This lighthouse has become a popular point of interest as well because of its minimalistic design, location, and history. During your trip, it may be a good idea to visit some of Aruba’s secluded beaches that are in the vicinity.